O.M.G! Easy to see why CB has developed such a cult following. Exceptional. Had us gobsmacked. 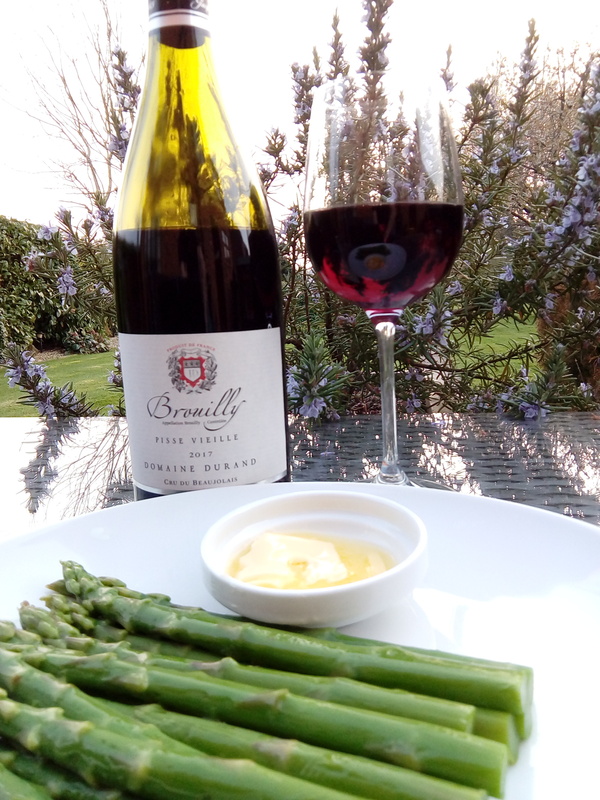 Absolutely delicious Beaujolais. Soft,round, lovely mouth feel, very floral with gentle acidity tieing it all together. If all the 2017 Beaujolais are up to this standard I’m going to be delighted. 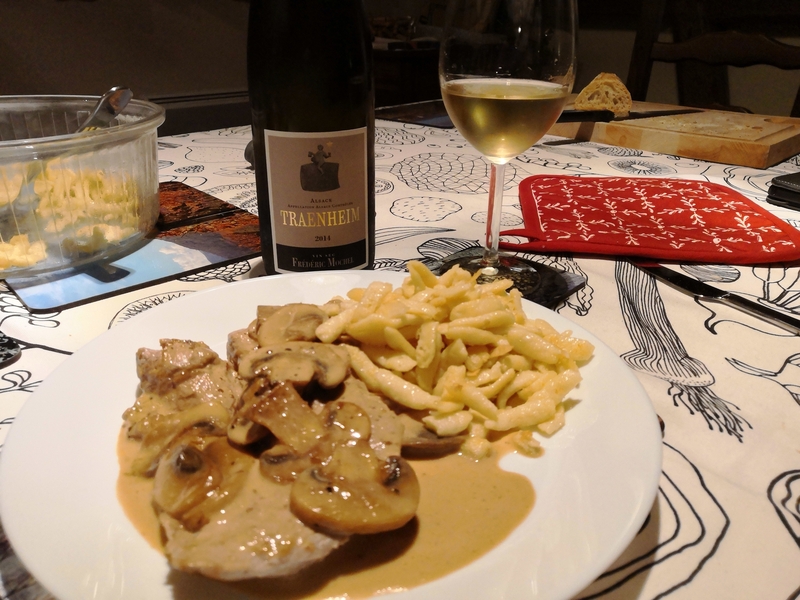 Yesterday evening, local Alsace asparagus with Rolly Gassmann Moenchreben Muscat 2012, followed by veal and mushrooms with a 2014 Traenheim blend of pinot blanc and pinot gris from Frédéric Mochel. 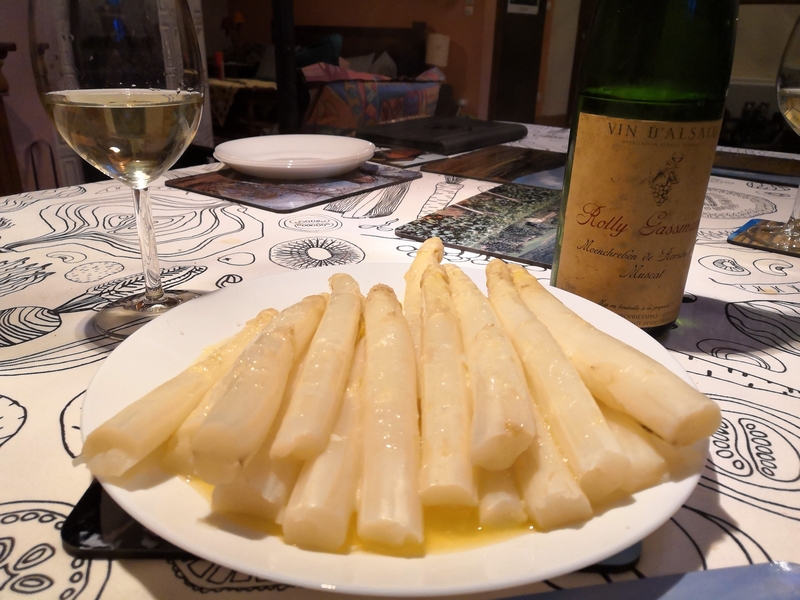 The muscat was just right with the asparagus - fragrant and floral, characteristic Rolly Gassmann residual sugar, and a minty and balanced finish. The Traenheim is a good combination of appley and peachy pinot blanc with a drying and slightly tannic finish from the pinot gris. A good food wine. Two Carignans (I like this underappreciated grape). 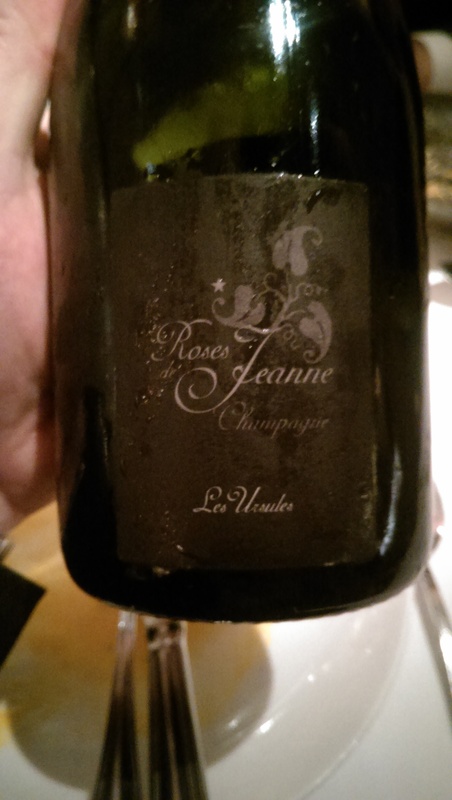 These two are quite similar (both old vine of course), and so interesting to taste together. 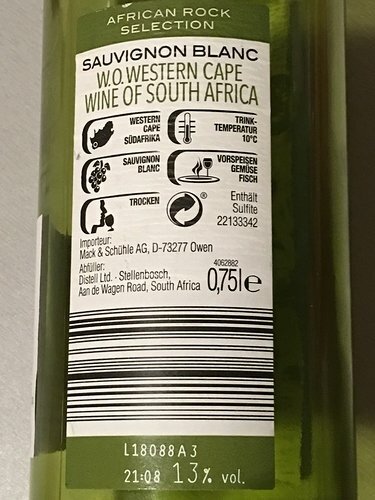 The Israeli wine is a bit richer and has clearly seen a bit of oak. Younger too, and could possibly use a bit more time. The Aupilhac is rather fresher in profile, with more acidity. Both wines could in fact age some more, though I’m not sure they need to. Celebrating my 45th year on this planet in Strasbourg this evening. The train from Stuttgart was cencelled, so didn’t think we’d make it - but managed to find an alternative train, thankfully! Had dinner at a lovely little Winstub; had a 2015 Sylvaner Grand Cru Zotzenberg for an aperitif (must get this one from the Society!) - to go with escargot in Munster cheese sauce, and we shared a really fruity and delicious 2017 Pinot Noir with our main. Cherries, mushroom funk and a lovely acidity. At 13.5% it had more body than I would normally expect of an Alsatian pinot. Lovely stuff! Finished the evening with a Mirabelle schnapps. Oh, how I like the stuff! Plum- flavoured fire! Happy Birthday! Glad to hear you’re celebrating in style!! Happy Birthday indeed, and glad your plans weren’t too derailed (sorry for the pun). 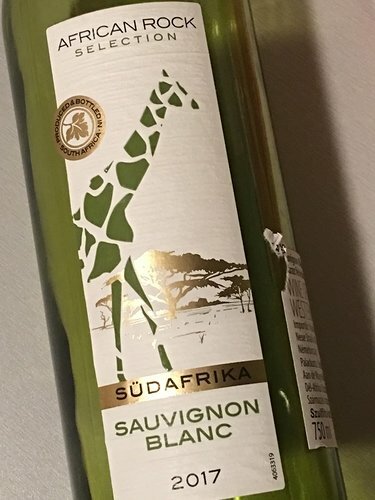 Good choice of wines. That Barthel pinot noir is indeed lovely. Enjoy the festival of Inbar! Happy Birthday @Inbar. Your birthday trip sounds delightful! I bought a bunch of Society wines fairly randomly last week to revisit some old flames and shake up my casual midweek glasses a bit. 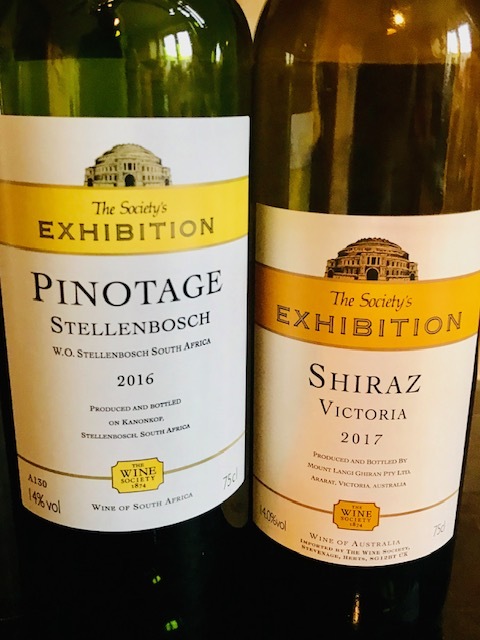 This week - 2 wines I have avoided in the shape of the Exhibition Shiraz Victoria and the Exhibition Pinotage Stellenbosch. Both bottles exhibited the typicity you’d expect from an Exhibition wine and both were revelatory in different ways. I guess there was some emotional baggage still attached to Shiraz from youthful drinking when I didn’t know any better - however me and MrsPaul both found the oak and smoke spiciness of this Shiraz extremely easy and fun to enjoy. A bit like listening to an old record you still know all the words to. It served as a great reminder that for friends and BBQ’s this should be a contender. We certainly will revisit it for that this Summer. The Pinotage was a case of once bitten, twice shy - years ago I made a note to myself to avoid it and unfortunately in this case I could have heeded my earlier advice. It certainly lived up to its reputation as a marmite varietal. I can see there’s some love that’s gone into this but a blue cheese finish is definitely not for me so case closed. MrsP seemed to like it more. Either way, a good example of Exhibition Wines doing what they’re supposed to do. Great stuff! We had this earlier in the week. Hmmm. Garage cool, it had a playful sweetness to the nose, like pink-flavoured sherbet dib-dabs or something. This switched to cherry cola after a few swirls and a few more degress celsius, but that’s about as fun as it got. The other half wasn’t keen, although she couldn’t put her finger on why. I enjoyed it but no more than, say, the own-brand Chianti Rufina, a good few quid less. 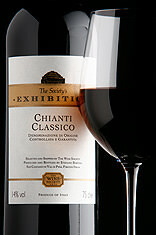 I think the Society’s Exhibition Chianti can be rather stern when young, which is fine and typical. I wonder how it might age? - not something I’ve ever tried. 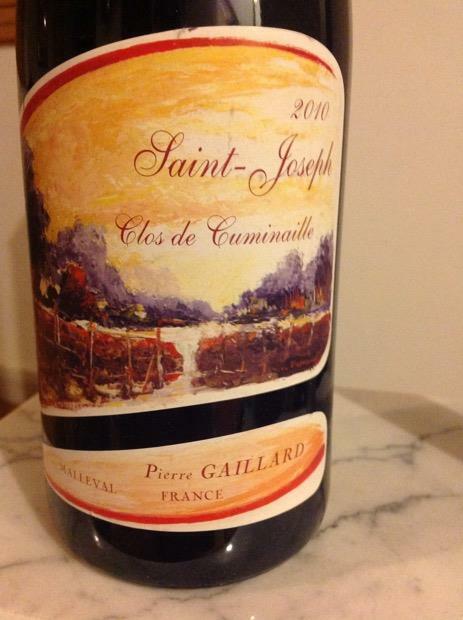 Average of 88.8 points in 12 community wine reviews on 2009 Pierre Gaillard St. Joseph Clos de Cuminaille, plus professional notes, label images, wine details, and recommendations on when to drink. 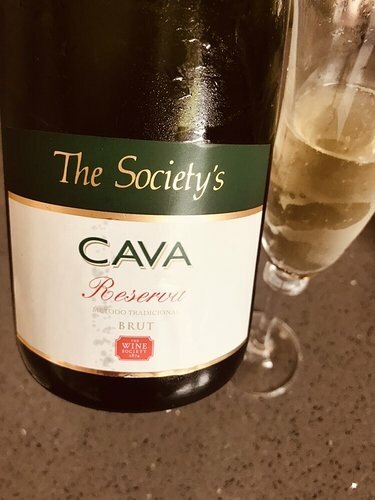 a glass or two of this whilst watching the footy. Really very nice at the moment. Its nicely structured for sipping. Glad I have the rest of a half case to get through. 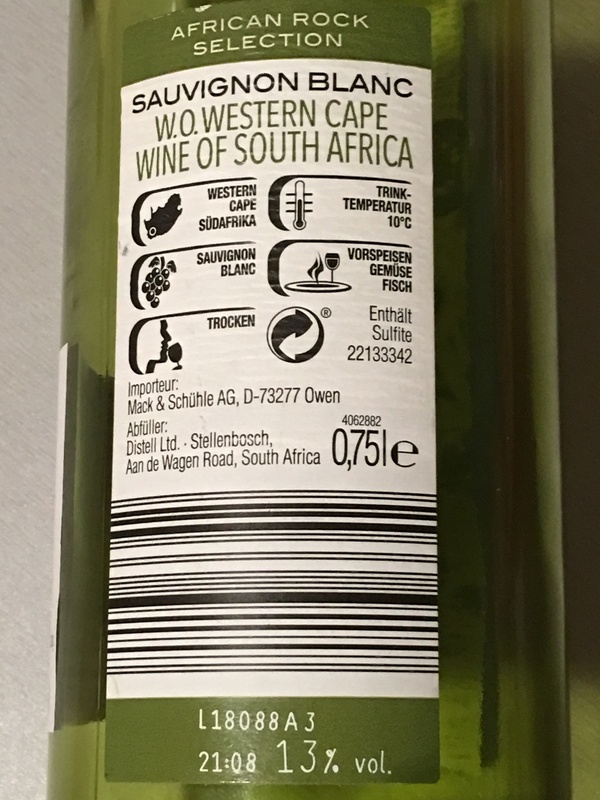 The drinking window on the current vintage (2016) is now to 2025. I wonder if it does it disservice to say ‘now’. Ah bought some of this in the 2017 EP. Looks like I have. a few years to wait. Hope I make it. Oh I don’t know about the wait, I guess this has been drinking for a while. Of course 2017 isn’t the same as 2009, which I think was more backward and structured. I’ve got another bottle so I’ll leave it a few years and see what happens. 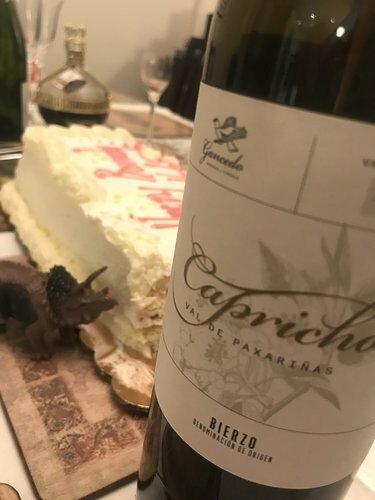 But it seemed less like a wine with good potential that needs time, and more like one that’s just a bit so-so, although I appreciate that sometimes it’s not easy to say for sure which one it is until it’s too late. Indeed! I must admit I am commenting on previous years rather than the 2015, so you may well be right on that score.